Windows Hello is a biometric security system that allows Windows users to log into their devices, applications, and OS without passwords but using a fingerprint, iris scan, facial or voice recognition. Windows Hello stores different types of users personal information: digital identities, PINs, plaintext logon passwords, etc. Reset Windows Password recovers all kinds of personal data saved in Windows Hello. First of all, you will need to specify the Windows directory of the target Windows 10 system. The program then scans the target Windows directory for any personal data and outputs found information to the screen. 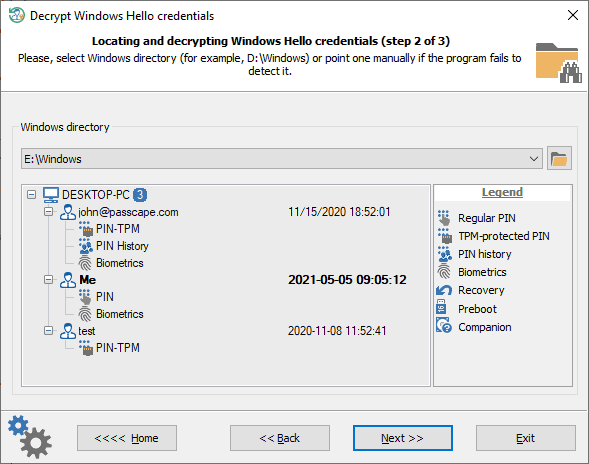 Reset Windows Password automatically decrypts logon passwords if the user accounts were set up to logon using biometrics, for example, fingerprint or face recognition. 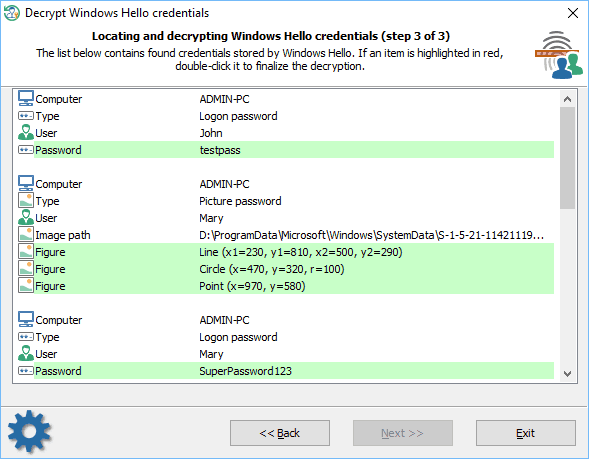 If an item in the table is marked in red, it means that to finalize the decryption the program needs to know the PIN code of the user account. Double-click the item and type in the PIN that corresponds to the user account.